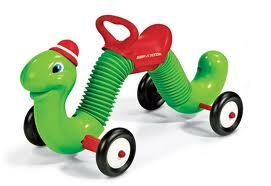 The Inch Worm, which was a worm shaped sit on toy with a saddle on it for our tiny bottoms. Really it was a scooter with shaped like a caterpillar with a green hat. Honest it was, and it was made by HASBRO at the beginning of the 1970s. Sure it was one for the ladies though. You may better remember it, as the only way to get it moving was to bounce up and down on it so it would move forward a little. Yes now you remember.